From bestselling author Kathy Reichs a book set in Charleston, South Carolina, the center of a lucrative, clandestine, sophisticated trade in body parts, the kind that leaves the donor dead. Summoned to South Carolina to fill in for a negligent colleague, Tempe is stuck teaching a lackluster archaeology field school in the ruins of a Native American burial ground on the Charleston shore. But when Tempe stumbles upon a fresh skeleton among the ancient bones, her old friend Emma Rousseau, the local coroner, persuades her to stay on and help with the investigation. When Emma reveals a disturbing secret, it becomes more important than ever for Tempe to help her friend close the case. The body count begins to climb. An unidentified man is found hanging from a tree deep in the woods. Another corpse shows up in a barrel. There are mysterious nicks on bones in several bodies, and signs of strangulation. Tempe follows the trail to a free street clinic with a belligerent staff, a suspicious doctor, and a donor who is a charismatic televangelist. Clues abound in the most unlikely places as Tempe uses her unique knowledge and skills to build her case, even as the local sheriff remains dubious and her own life is threatened. Tempe's love life is also complicated. Ryan, her current flame, has come down to visit her from Montreal, and Pete, her former husband, is investigating the disappearance of a local woman—and he and Tempe are staying in the same borrowed beach house. Ryan and Pete compete for her attentions, and Tempe finds herself more distracted by her feelings for both men than she expected. 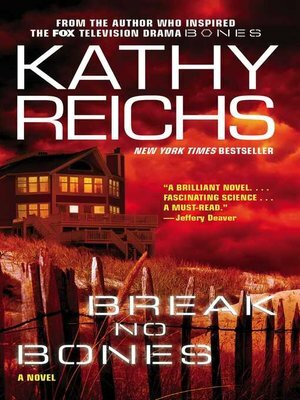 Break No Bones is a smart, taut thriller featuring the kind of high-stakes crime that makes the headlines every week. Reichs, the inspiration for the hit Fox TV show Bones, is writing at the top of her form, and Tempe has never been more compelling.